At first I didn't realize these were real plants. They looked like something a seamstress would have. I've never seen a Pincushion (Nertera granadensis) plant before. 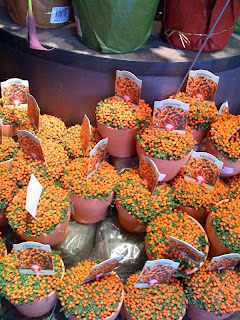 The tiny bead-like orange berries on this plant make this the perfect festive plant for Halloween and Thanksgiving. It's a bit odd that these native New Zealand plants looked so fresh considering they require full sun or they produce few berries. The Pincushions are apparently very hard to care for and die fast.